Andrew Jackson is one of the best known, most influential, and certainly one of the more controversial presidents in American history. The populist president transformed the way in which presidential campaigns are conducted and championed a number of ideas and causes that were not always successful, but defined his presidency nonetheless and set the course of American history for the following few decades. Most people know about President Jackson’s bank war and his policy of Indian removal, but just as important as those policies was the Nullification Crisis of 1832-1833. 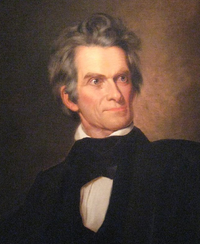 The Nullification Crisis was a volatile political situation whereby the state of South Carolina, led largely by Vice President and then Senator John C. Calhoun, declared the tariffs of 1828 and 1832 null and void. As the rhetoric surrounding the controversy heated up, Jackson threatened to use the military on South Carolina to enforce federal law, while South Carolina politicians ordered its state militia to be on guard. The tensions were high, as was the possibility of secession. Finally, largely due to Senator Henry Clay, a compromise tariff was enacted in 1833 that diffused the situation, but not before the crisis made a great impact on America’s political landscape. The conflict of state’s rights versus unionism made its first showing in what would be the first of many debates leading up to the Civil War. President Jackson’s political capital was damaged by the crisis, but the prospects of his old enemy, Henry Clay, grew as a result of his efforts. Finally, the Nullification Crisis led directly to the formation of the Whig Party. Adams signed the tariff into law in 1828, which not only set a high import charge on wool imports, but also on hemp, pig iron, and rolled linen. The tariff was supported by hemp farmers in the west, as well as some manufacturers in the northeast, where the Democrats were attempting to make inroads and form a coalition. Jackson publicly supported the tariff, arguing that the United States should protect its infant manufacturing base and use the revenue derived from the duties to pay for the national debt. But not everyone in the new Jackson coalition was happy with the tariff. 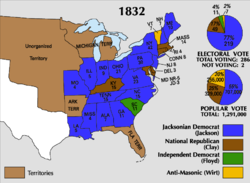 The politics of supporting the 1828 tariff paid off for Andrew Jackson and the Democrats, as it helped him win the presidency by taking states in the west and northeast whose industries were helped by it. 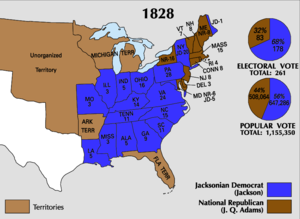 Jackson cruised to an easy victory in tariff of 1828 and was able to focus on the bank war and Indian removal for his first term, but 1828 was still a political issue that could have possibly derailed Jackson’s presidency. During the summer of 1833 a compromise tariff was passed through Congress and sent to Jackson’s desk, which he readily signed. But it was still too much for the Nullifiers of South Carolina. Although Jackson cruised to an easy victory in his 1832 reelection bid, thanks in large part to support in the northeast, South Carolina electors cast all their votes for Virginia governor John Floyd – the Nullification movement was officially born. Shortly after the 1832 election, on November 24, the South Carolina Nullifiers held a convention to declare the 1828 and 1832 tariffs null and void, which triggered a variety of responses in Washington and South Carolina. In response, President Jackson issued a testy proclamation denouncing the Nullifiers on December 10, 1832 and Calhoun resigned as vice president on December 28, although he was nearly at the end of his term and was to be replaced by Martin Van Buren. Calhoun then became the national face of the Nullifiers, putting South Carolina on alert that they might have to use force to stop the collection of duties in their state. As all of these events unfolded, the philosophies driving the nullification debate became clearer. As stated above, Calhoun represented the Nullifiers nationally and publicly articulated an idea that the entire debate was about state’s rights, which the Nullifiers supported, versus an ever encroaching federal system. Diametrically opposed to these ideas was the idea of national supremacy and the union as being the absolute authority in the country, whose decisions could not be usurped by the individual states. Senator Daniel Webster (1782-1852) of Massachusetts was one of the most vociferous proponents of the union philosophy during the Nullification Crisis. Finally, Jackson represented a position that was somewhat in the middle but also unique. 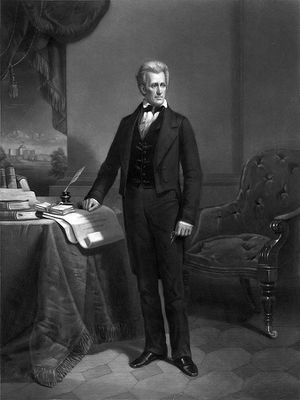 As a populist, Jackson believed that the majority of the citizens favored the tariffs and that their will should be respected and followed. As a nationalist, Jackson saw the Union as the identity of the nation and although he respected the idea of state’s rights, at least rhetorically, he believed that the Union was indissoluble. At the height of the Nullification Crisis it was less a matter of a clash of political parties but more so a fight between Unionists and state’s rights advocates. In early 1833, the Nullifiers appeared unwilling to budge on their position and some of the more radical members of the movement began whispering about secession. The ever bellicose Jackson was not in the mood to deal with such talk and let some of this own threats leak to the press. 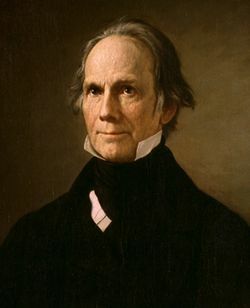 As all of this was going on, Henry Clay, who was then a Senator from Kentucky, stepped forward to earn his title as the “Great Compromiser.” Working with Calhoun, he crafted a compromise tariff that used the 1832 tariff as a base point but reduced duties over a nine-year period to 20%. The compromise satisfied most of the national Nullifiers, but something was needed to appease Webster, Jackson, and the Unionists, so a “Force Bill” was attached to the tariff that authorized the use of force to collect the duties if need be. Although the compromise tariff had the votes to go through Congress, it ultimately came down to how the state Nullifiers in South Carolina viewed it. On March 11, 1832, the Nullifiers held another convention where they voted to accept the compromise. The crisis had been averted, but immense political damage had been done. The impact the Nullification Crisis had on the political landscape of antebellum America may not have been very apparent, but it was profound. The philosophical battle between Unionism and state’s right first manifested itself during the crisis, but would continually grow until the Civil War finally happened. The philosophical battle between the concepts also became more heated and personal, with the Nullifiers being viewed as a threat to the Union by the Unionists. Conversely, the Nullifiers/state’s rights advocates became much more entrenched in their positions, especially in the state of South Carolina. In 1834, the Nullifiers who ran the state required state militia and civil office holders to swear an oath of loyalty to the state of South Carolina over the federal government. It was merely a sign of things to come. The Nullification Crisis of 1832-1833 was an American political crisis that has been largely overlooked today by many, but was one that had far-ranging impacts on antebellum American history. The crisis set the stage for the battle between Unionism and state’s rights, which eventually led to the Civil War. The Nullification Crisis also stalled the agenda of President Jackson’s second term and led to the formation of the Whig Party and the Second American Party System. If there is one single event in early American history that foreshadowed the Civil War, it was truly the Nullification Crisis. After all, the Civil War began in South Carolina.